Throughout the International Year of Astronomy 2009, the IAU’s Working Group on Astronomy and World Heritage, later to become IAU Commission C4 on World Heritage and Astronomy, worked with the International Council on Monuments and Sites (ICOMOS), the advisory body to UNESCO concerned with cultural sites, to produce a Thematic Study on the Heritage Sites of Astronomy. 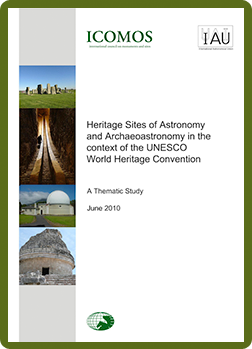 This document, whose full title is Heritage Sites of Astronomy and Archaeoastronomy in the context of the World Heritage Convention: A Thematic Study, was published on 30 June 2010. The document presents an overall vision on astronomical heritage, attempts to identify what constitutes “outstanding universal significance to humankind” in relation to astronomy, and identifies broad issues that could arise in the assessment of cultural properties relating to astronomy. For examples of other ICOMOS Thematic Studies, see here. This was the first Thematic Study in any field of science heritage. It is elaborated using examples of properties, including some already on the World Heritage List or national Tentative Lists. The ICOMOS-IAU Global Thematic Study on Astronomical Heritage was presented to UNESCO’s World Heritage Committee at its meeting in Brasilia at the end of July 2010. Its endorsement by the meeting means that it may be used as the basis for developing specific guidelines for UNESCO member states on the inscription of astronomical properties. The 16 main themes covered by the Thematic Study are: Earlier prehistory; Later Prehistoric Europe; Pre-Columbian America; Indigenous uses of astronomy; Ancient and medieval Far East; India; Mesopotamia and the Middle East; Ancient Egypt; The Classical World; Islamic astronomy; Medieval astronomy in Europe; Astronomy from the Renaissance to the mid-twentieth century; The development of radio astronomy; Applied astronomy in modern times; Space heritage; and ‘Windows to the universe’—starlight, dark-sky areas and observatory sites. The main authors are Working Group Chair Professor Clive Ruggles and Professor Michel Cotte of ICOMOS, with a range of other authors being responsible for particular chapters and case studies. See the TS1 contents page for further details, and to download the entire volume or individual chapters or case studies. The Thematic Study exists in two versions. The initial version was published as an e-book in June 2010. It was this that was presented to UNESCO’s World Heritage Committee at its meeting in Brasilia at the end of July 2010. This e-book version is available for free (see the TS1 contents page). A limited-edition printed version was published thanks to financial sponsorship from the IAU and ICOMOS. This was published in 2011 but is now out of print. The contents of the Thematic Study form the basis of the thematic essays, many of the case studies, and several of the information pages available on the Portal to the Heritage of Astronomy, where they are being gradually enhanced and updated. A second ICOMOS–IAU Thematic Study (“TS2”) was published in 2017.